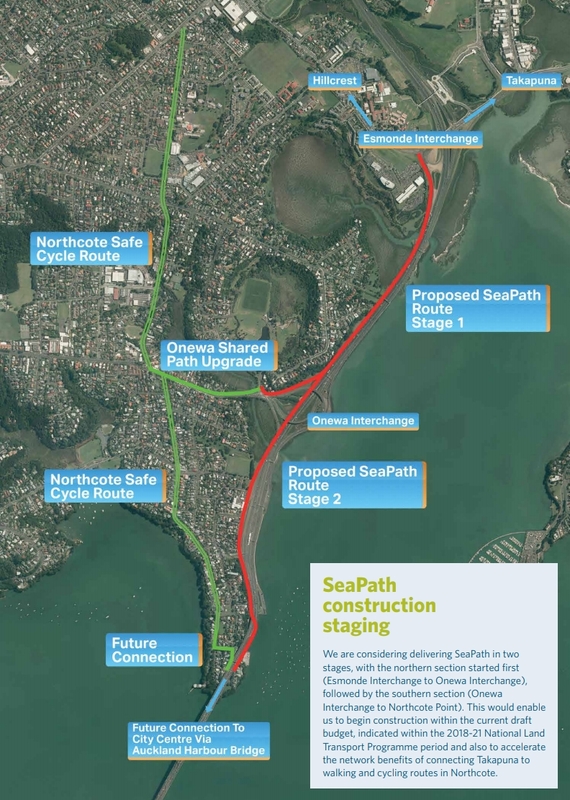 The NZTA are starting public engagement today on Seapath, the walking and cycling path alongside the Northern Motorway from Esmonde Rd to the Harbour Bridge, where it will link in with Skypath – which the NZTA have also been tasked with building. When both are complete, they will transform the opportunities for riding a bike on the North Shore. refined our proposed route and given more thought to how it could be built. Further investigation has helped us better understand a range of geographical, environmental and technical considerations and identify how the project might respond to meet these challenges. The route is shown below. It hugs the land side of the motorway which is primarily to make it easier to construct (has less impact on the coastal environment), has better connections to local roads and keeps people, dogs and pests away from endangered Dotterels that nest in Shoal Bay east of the motorway. Although perhaps the project needs a new name given it’s not by the sea. The previous consultation showed a path with a few detours in it, such as to get around the Stafford Rd and Onewa Rd ramps. It’s not clear if these have been addressed or if the red line is just the high level desired route. SeaPath is a shared walking and cycling path, for use by people of all ages and abilities; whether on foot, bike, scooter, wheelchair, pushchair, or skateboard. It will comprise a mix of materials, such as concrete path and raised wooden boardwalk, the latter proposed for many of the coastal sections. The look and feel will be similar to other shared walking and cycling paths adjacent to motorway routes, such as the Northwestern Cycleway. There will be opportunities to incorporate design elements along the route to reflect the area’s rich cultural heritage and natural environment. SeaPath will be up to four metres wide. For some sections along the route we are balancing the requirement for a wide path with the benefits of directness. This might mean that the path narrows in places, or it could ascend or divert to where it can be built wider. These challenges are faced in the area between Onewa Interchange and Heath Reserve, constrained between the motorway and cliff face. At some locations where we need to cross a busy motorway on-ramp or off-ramp, we are considering different options to divert the path inland to where a safer crossing can be created. I think it would be preferable to design the path to be wider than 4m as like the Northwestern Cycleway, I can see this being quite popular for a range of activities. And if space is an issue, perhaps the NZTA could make more by narrowing the motorway lanes slightly to free some more up. As the diagram eariler explains, it appears the NZTA are now looking at delivering the project in two stages, the first from Esmonde to Onewa and the second from Onewa to the Harbour Bridge. This makes sense and should hopefully make it easier to get started sooner. Finally, on Skypath, they say they’re also working on a detailed business case for the project. I hope the Northcote Group for Resisting Urban Mobility Plans with Solicitors (GRUMPS) is lying down when they read this. Agree that more width is better. Where they say it needs to narrow between the motorway and the cliff face, it looks like it cold be fairly easily and cheaply be raised and cantilevered out over the hard shoulder. I say cheaply – relative to trying to do the same with infrastructure that is loaded more heavily like roads and PT. It appears to me this is quite a different consultation process to what AT is now doing for its streetscape and cycleway projects. Could this be a robust way to experiment (albeit probably unintentionally?) with different consultation processes in order to find the best way forward? This is great news. What is the northern extent? It says “to Esmonde Rd” but surely it’ll go over Esmonde Rd and connect with the AUT campus? I would have thought getting all the way to the Akoranga Bus Station was important. Will people cycling be able to use the overbridge to the station, or is this path going to fall just short? Since it is an NZTA project, I suspect it will end where the Esmonde off-ramp ends, because from there it’s over to AT to deliver the local connections. It really is time to review the Esmonde cycling and pedestrian provision though. Going through there takes forever with all those crossing lights to wait for. Seems to me there’s an opportunity for displaying a seamless interface between NZTA and AT by coordinating the project to end at the bus station. If they care about PR. Off topic, but asking in general, then asking again when all the details are in, is exactly what you do in a democracy, right? Alternatively make sure that the “change” vote requires an unhealthy philosophical dilemma. Like the need to put into a constitution that there’s a difference between the “life” and the “health” of a woman. #Ireland’s 1990’s abortion referendum. I don’t think that principle works with independence referenda, which Brexit is similar to. The EU would have unlikely bothered negotiating a settlement if Britain had just said we might leave. I think it is time the 47.5 % of people who supported ‘remain’ moved on and figured out how to get the best for their country in the new arrangement. Except that every option for brexit is bad. 52.5 % of people chose the uncertain path to the cliff edge. While it might not be sensible, it is certainly democracy in action. Based on the assumption that all their EU savings would go into the NHS. That is, a lie. And it wasn’t the only one. I’m not sure the “democracy in action” (hoodwinked?) argument stacks up and I think many would change their vote now that the realities are, well, a reality. Nonetheless, outside of a second referendum, what’s done is done. The leave side cheated. They fraudulently over-spent, breaking electoral law. They were assisted by, or acted in the interests of, at least one foreign power. They broke bipartisan agreements to pause campaigning for a period after an MP was shot. It’s the sort of thing that gets frowned on in other countries. I would say a second referendum would be the correct thing to do, in the interests of fairness and ‘democracy in action’, given that the vote was so close. I hope for everyone’s sake they tunnel the path under the motorway on & off-ramps and don’t put in beg button crossings. The tunnel at Te Atatu is a wonderful thing and it’s makes me cry that the designers have strenuously avoided the same safety mechanism at the Royal, Lincoln & Huruhuru Road bridges. That will be the main point in my submission along with Heidi’s call to ensure phase one carries on to Aoranga Station and AUT. Going under the at grade traffic lanes would also be going under water, tricky and unpleasant for users. I was thinking about this. The on-ramp looks relatively easy. Place a box culvert over the ramp and then fill in either side so cars descend on to the motorway. Good call. How about splitting the difference to keep the climb down. Lower the offramps one to two meters so to get 4.5m clearance under the cycle overbridge it’s only 3m above ground level. Cars will cope far better with the occasional little flood in their underpass than cycles would. Some interesting ideas, in either case I quite like a bit of up & down to vary the ride, making it more interesting. On topic; I look forward to riding to Northcote TC for noodles… but before then seeing detailed plans of the tricky bits. Is asking that one of the links to the local road network happens right at the police station a good idea for easy access to getting help if required? That red line looks really good. It’d mean a number of under or over passes through the interchange but its otherwise likely to be nice and level, direct and safe. However the text smells like they’re still going to make it long and wiggly, just like other cycle infrastructure that has been built recently (e.g. waterview) that is fine for a trip with the kiddies, but not suitable for commuting (e.g. Its longer, inconvenient and less safe than riding on the road). Are they going to change the name from SeaPath to ShittySideoftheMotorwayPath? The motorway cycle network could be called the FUMES network: Following Unhealthy Motorways is Easiest Solution. Reads the line about “The Costal Environment” then looks at the picture…..
Dotterels. Never around when you need them. I’ll ask the presumably dumb question… Why can’t seapath be next to the sea? The NZTA took on board the environmental concerns raised at each of the BOI hearings for new polluting motorway infrastructure in coastal environments and have decided that although they’d still like to put motorways in many coastal locations, they’ll compromise by making sure cycleways are kept away. Ha! This is so true. The main pro point for being on the landward side here is that it allows for more connections to the local roads in Northcote without having to build a bridge over the motorway for each one. But if getting past the Onewa intersection means huge diversions or expensive (and unlikely) over- and under-passes, then that advantage is lost. The fact that it is the Northern Busway that occupies the most seaward space at present presents another difficulty though – those lanes can’t be lost, whereas the left lane between Onewa and Esmonde is certainly not the busiest. It will be vastly useful if the cycle path extends to Birkenhead. This will provide another great alternative mode to ease the already heavily congested Onewa road. Also if there is a connection to Birkenhead ferry terminal. Tourist can ferry to birkenhead with bike and cycle back to CBD to make a scenic roundtrip sightseeing. Any rough calculations on the amount of combustion-byproduct particulate matter the average cycle commuter will inhale over the course of a year? • Car drivers are consistently exposed to the highest average levels of CO.
• Locating cycle paths just a short distance from roads can reduce pollution exposure significantly. • One hour of commuting could contribute up to 20% of total daily CO and UFP. Given the middle point there, we really do deserve more separation between a cycle path and a motorway. I suggest that an essential part of the site investigation phase should be installing a weather station and air analysis unit to understand the wind movements etc over a full year. While we can all read a wind rose to understand the typical patterns, it would be good to understand the actual conditions, which on a coastal edge are highly likely to be very variable. Given the health issues due to combustion fumes, I’d say not doing this would be pretty negligent. True, and they’ll need to consider that climate change will probably see changing wind patterns. Therefore, the worst case scenario (whether no wind, or low wind flow from the motorway) will need to be the design parameter. One cigarette per day is the rough equivalent of a PM2.5 level of 22 μg/m3. Over the last 48 hours Penrose peaked at 62μg/m3 or about 3 cigarettes. I assume this was during rush hour. Matt, your last comment is that “they say they’re also working on a detailed business case for the project”. Are we expecting a more realistic and holistic set of benefits to be included in this business case? Thanks, Max. This one mentions lots of benefits: https://www.nzta.govt.nz/assets/Walking-Cycling-and-Public-Transport/docs/benefits-of-investing-in-cycling/cyclelife-benefits-booklet.pdf I think I will probably find some more information when I look again at the New Plymouth and Hastings pilot studies. I have a problem with the seapath being on the inland side of the motorway, one word sums it up SAFETY .with all the talk about zero harm nzta design a cycle/walkway where you have to cross motorway off ramps Stafford rd exit(https://www.google.co.nz/maps/@-36.8166891,174.7500306,3a,90y,310.23h,73.29t/data=!3m5!1e1!3m3!1s9j8RmXtuag9gzdEf4d5w0Q!2e0!6s%2F%2Fgeo0.ggpht.com%2Fcbk%3Fp) and Onewa off ramp streight into Sylvan ave(https://www.google.co.nz/maps/@-36.812467,174.7508307,3a,22.1y,333.59h,86.65t/data=!3m5!1e1!3m3!1s4fPfdUBNg-qN__f6x1EDag!2e0!6s%2F%2Fgeo0.ggpht.com%2Fcbk%3Fp) which we’ll have to cross ,cars cross this intersection at motorway speeds running amber/red lights .At the nothern end of seapath you have to cross Akoranga dr with traffic turning left from Esmonde rd off ramp(https://www.google.co.nz/maps/@-36.8000272,174.7593806,3a,90y,155.13h,103.78t/data=!3m5!1e1!3m3!1sBOJkxDFiMXmnt6VKnIb1Yg!2e0!6s%2F%2Fgeo3.ggpht.com%2Fcbk%3) at speed but thats the end of seapath so nzta don’t care what happens to us its not there problem .From Akoranga dr to get to Takapuna you have to cross north bound motorway on ramp 1 lane fast left hand corner next is Esmonde rd south bound off ramp 3 lanes 1 right turning and 2 left turning lanes from there we come to the entranc /exit from the bus station 3 lanes 1 left slip lane in and 2 lanes out ,next is Fred Thomas dr which has 5 lanes to cross 2 of which are slip lanes heres an over view of the area,welcome to Takapuna https://www.google.co.nz/maps/@-36.7978953,174.7641767,611m/data=!3m1!1e3 as you can see using this cycle/walkway isn’t for the faint hearted. On the seaward side of the motorway they could build the cycle/walkway over the water like they have done at Westhaven,it would be flat, direct and safe with a low impact on the eviroment and only one road to cross where theres already traffic lights which would only need a beg button and a crossing added https://www.google.co.nz/maps/@-36.7966384,174.7660316,3a,75y,74.7h,96.39t/data=!3m5!1e1!3m3!1sXYnC53IQeWQMFSrOeevZaQ!2e0!6s%2F%2Fgeo1.ggpht.com%2Fcbk%3Fpa. on the inland side people in wheel chairs or with push chairs would find it hard work going up hill to Akoranda dr and all the lanes to cross may even stop them from using the seapath ,seaward side any one could use it with out fear of crossing roads or asending/desending hills .Seapath wont just be a cycle/walkway it will be an Icon a must do in Auckland . Narrowing the motorway lanes is one of the dumber ideas I’ve heard in a while, that’s just plain dangerous and irresponsible. Actually it would probably be safer, encouraging people to drive under the speed limit. Went to one of these “engagement” sessions and I think “marketing” session would be a better term. In a long discussion with one of the project team members, I left with the “gee, that would be nice, but we’ve completed our consultation and this is what we can deliver in line with what the community wanted” feeling of wasting my time. Onewa/Stafford interchanges: TBA in the business case. Both of us agreed that costs will mean cyclists exiting the motorway is most likely. Space west of the Onewa on-ramp, where the cliff is held back by a retaining wall, is what the project team sees as the biggest challenge in keeping costs down. I also asked about whether they had considered an integrated solution that modified the existing motorway to create space (I originally submitted that they should repurpose the busway south of Esmonde for SeaPath if they could create a bus lane out of the existing motorway – which should be possible given how wide the pavement is for only 6 or 7 lanes of traffic) As you’d guess, that wasn’t “in scope”, meaning a missed opportunity for what would be a world-class, and heavily used by locals and tourists, “sea path” on the eastern side (and motivate AT to upgrade the path through the estuary behind Barrys Pt Road – in dire need of upkeep – for a direct connection to downtown Takapuna). With the likely deviations at Stafford and Onewa, I think Northcote locals wouldn’t mind overpasses to link in with an actual wide SeaPath (but better integrate with Takapuna at the expense of AUT). The caption on the back of the 4-page brochure says it all: “Artist’s Impression: SeaPath’s Waitemata Harbour context creates a scenic route for commuting and recreation” in reference to a path sandwiched between a motorway, cellphone tower infrastructure and bushes blocking views to a greenspace behind. Thanks for that, Jeremy. I think ending the cyclepath at Esmonde Rd is simply negligent. They know AT slashed its cycling budget in half. They can’t say they are not responsible for putting cyclists off a path onto a dangerous road just because they say another organisation should take over from there. They should have to get it over the road into AUT at least. What do you think is the likely outcome at the Onewa Rd and Stafford Rd interchanges? I didn’t quite understand. They don’t have a proposed design for Onewa/Stafford road yet. It’s coming in next year’s business case. The impression I received was that they’re costing out the options of having cyclists (a) travel alongside the offramp/onramp, crossing the road with a dedicated signal, or (b) travel through directly with a grade-separation design – probably over the motorway ramps & under the Onewa flyovers as discussed above. NZTA know the community prefers (b), hence the red line in the plan, but in conversation they seem to have hinted that (a) is going to be much cheaper and, in a preview of the marketing for this change, better able to “connect” the community. Phase 1 (Onewa-Esmonde) is going to have a path all the way along the Onewa Northbound on-ramp anyways (the most expensive section according to the team), so I can’t see how two overpasses will end up cheaper in their business case than shunting the cyclists off alongside the much less constrained Onewa Northbound off-ramp. On the Esmonde issue, they truly believe that AT already has the short-term infrastructure in-place (so does AT – just look at the new N1 cycling map showing a smooth uninterrupted green line across the Esmonde interchange). Thus, the only upgrade they see necessary is a signal phase to allow cyclists to cross Esmonde to the northern side (the “shared path”). I told them (at Akoranga bus station) to walk up to Esmonde and count how many blue signs indicating the start or end of the path they encountered while walking across the motorway on said shared path. I’m sure you can take a single photo with 4 or 6 of those in frame – and be able to read them. Thanks. Oh dear. Why don’t we can the SH1 widening and provide funding for this to be done properly?